The history of the McGinley surname (and its many variants) is a long one in America. Our association with the state of Pennsylvania has been strong since we first arrived. Even today, more than half of all McGinleys in America are recorded in the state of Pennsylvania. The next biggest concentration of the name is in the neighbouring state of New York. Together, these two states account for more than 70% of Americas McGinleys. The first McGinleys started to arrive in America in the early 1700’s. It is generally believed that those who arrived prior to the early 1800’s, arrived as slaves either directly from Britain or by way of the Carribean Islands. We have recorded evidence of a James McGinley who arrived in Maryland in 1774, described as a 'runaway servant'. Bryan McGinley, even earlier, in the year of 1745 was also described as a slave when he was recorded in Philadelphia. No doubt there were many more McGinley slaves, probably most of them went unrecorded. The earliest recorded McGinley in America is a James MaGinley who was born around the year 1701 in Ireland, according to family tradition in Co Donegal. We know for sure that he was in America by the year 1726 as his name appears as a witness on a will. The noted Reverend Amos McGinley was born on the 4th March 1778, in Fairfield, Pennsylvania. He was the son of John McGinley and Jane Alexander. He was a very influential figure in the religious life of early Pennsylvania. He was unusually for a McGinley, of the Presbyterian faith. During his lifetime, he married over 697 couples and acquired the nickname of ‘The Marrying Parson’. Another well known son of John McGinley and Jane Alexander was Lt Col Commandant James McGinley. He was born in the year of 1763 in Fairfield Pennsylvania. He was a ‘Pioneer of Tennessee’ for qualification for the ‘First Families of Tennessee Certificate’. He was well known and well respected in his community. He was a Revolutionary War soldier. Yet another noted person of the surname McGinley, directly descended from the early settler John McGinley, was Ebenezer McGinely (note that his surname was at least once recorded thus). Ebenezer was almost certainly of the Presbyterian faith like his family. His father was James McGinley and his mother Susan Alexander. During the American Civil War, the people of Fairfield played their part, like the many McGinleys throughout the country who were active. The Fairfield Zouaves were organised in August of 1861 with the name of Ebenezer McGinely listed as a Lieutenant. Son of Hon. Joseph McGinley, William was born on the family farm in Fairfield, February 15th 1831. Because he spent most of his life outwith Fairfield, most people do not associate him with the Fairfield McGinleys. He was educated at Gettysburg College and at Washington College. He read law and was admitted to the bar at Gettysburg before turning to religion. He graduated from Andover Theological Seminary (Andover, Massachusetts) in 1858. James McGinley, died in York County, Pennsylvania in 1755. James McGinley had arrived in Maryland in the year 1774. Slave. John McGindley recorded in Butler County, Pennsylvania in 1776. Anna McGinly recorded in Adams County, Pennsylvania in 1797. Eliza McGinly recorded in Armstrong County, Pennsylvania in 1797. A survey in 1920 (taken from the US Government Census of 1920) indicated the ethnic origin of those named McGinley. When asked, the following results came out: White - 3,553, Black - 11, Mixed - 9, Unknown - 2. 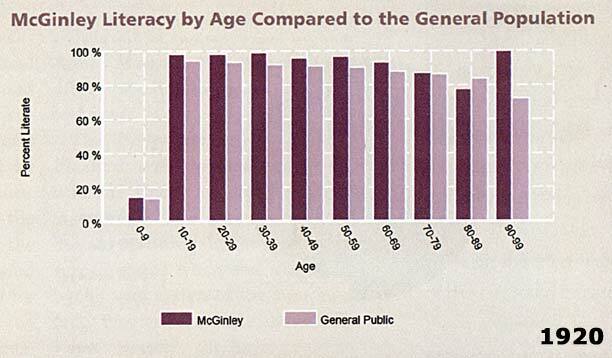 The above graph shows an interesting comparison between McGinleys in America and the general American public. It can clearly be seen that the McGinleys constantly are above average in all age groups accept the 80 to 89 age range! (Information from Ancestry.com from 1920 US Government Census information).